A collection of articles and maintenance tips relevant to music production. Items will be constantly added at various times - check regularly for updates. Distortion in a sound system can be defined as any deviation between what is fed into it and what we hear coming from it. Even modifying the tonal balance is technically distortion. Some forms of distortion can be very unpleasant to listen to (and usually instantly recognisable as distortion), some distortion can be pleasant to the ear although still recognisable as distortion (such as overdriven guitar etc), whilst some forms of distortion can be interpreted as pleasant but not recognisable as distortion. It is this last type of distortion that can have serious unintended consequences in relation to sound systems, and is commonly what we experience at nearly any live music performance where amplified sound is used. The most distortion within a sound system is generated by the speakers - the electro-mechanical devices that convert electrical signals to sound by vibrating, and therefore compressing and rarefying the air in contact with them, causing compression waves to radiate outwards. Whilst the electronic processing within a sound system can have distortion levels expressed as hundredths of a percent, the distortion generated by speakers can be measured in tens of percent. There are a number of different types of distortion, but we will concentrate on the most common - harmonic distortion. Here, the distorted tone can be interpolated as the original tone plus various levels of added harmonics (multiples of the original tone at octave spacings higher than the original). A "buzzy" tone (such as a square or triangular wave from a synthesiser) can have harmonics extending ten or more octaves above the base note. Due to the ear being more sensitive at higher frequencies (its main purpose being to hear speech from other people for communication), the harmonics from mid to high frequency distorted notes are readily heard and able to be identified as such. However, the situation at low frequencies can be somewhat different. As the ear is quite a small device compared to the wavelengths of low frequency sound, it is nowhere near as sensitive to detecting low frequencies. However, the ear / brain combination has this wonderful ability to "fill in the gaps" (some of this ability evolutionary, some learned) - if the low frequency sound contains harmonics that the ear can hear well, the brain will deduce the fundamental tone is there based on the level of harmonics. Even if a tone consists only of harmonics of a low note, without the fundamental frequency of the note existing, the brain will assume the fundamental must be there and we will "hear" it. It is generally accepted that 20Hz is the lowest frequency humans can hear, but most would not get that low. Below that frequency, sound is felt as vibrations by the body, and for several octaves upwards from here, the sensation of felt vibration diminishes as the ear starts responding better. If you think you are listening to, say, a 40Hz tone (around the fundamental frequency of the low "E" on a 4 string bass guitar), but cannot really feel much vibration from it, then there is a good chance that you are listening mainly to harmonics and your ear is "fooled" into thinking the 40Hz note is there (I call this "pseudo bass"). use a combination of any or all the above. Many "long excursion" speakers are available that aim to maximise the amount of cone movement whilst minimising the level of harmonic distortion, however they often suffer from other drawbacks including low efficiency - more electrical power must be fed into them for a given acoustic volume, which produces more heat within the speaker, increasing non-linearities. Law of diminishing returns prevails. Larger cone surface area can be provided by using multiple speakers (as opposed to one much larger speaker which will have other problems related to physical mass) each running at lower volume. Just because a speaker is rated at, say, 600W doesn't mean it has to be fed that - six such speakers running at 100W each will sound much better than one speaker at 600W (and will be louder as well), however this approach involves considerably more space and expense. Many smaller systems that are sold and operated with the ratio of one sub box to two top boxes will benefit significantly by running two or more of the subs per top box. The most common type of speaker cabinet for low frequency use is the ported or "bass reflex" box, where the speaker is mounted on a sealed box fitted with a particular sized vent. The box internal volume and vent size and length form a Helmholtz Resonator, which acts similarly to blowing across the top of a bottle - at the tuning frequency output level is increased and speaker cone movement is decreased, thus reducing distortion. However, if the box is operated below its tuning frequency, harmonic distortion and cone movement increases significantly, and physical damage to the speaker can result. For low tuning frequencies, the box, vent and speaker still need to be large to provide meaningful output. 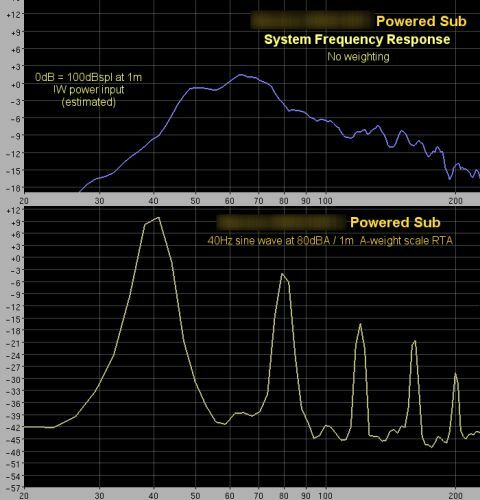 As the current trend is to keep boxes physically small, most commercial low-end to mid/high-range subwoofer boxes are in fact tuned to a higher frequency, relying on "pseudo bass" harmonic distortion to make them be perceived as responding to low frequencies. A speaker can be made much more efficient by coupling the front of it to a horn which expands exponentially along its length - the horn converts small speaker cone movement at high pressure to large air movement at low pressure, providing much higher volume levels with significantly reduced distortion. Horns are commonly used for the high frequency section of sound systems to permit lower electrical power for a given volume, which reduces the size of components and allows them to more easily reproduce higher frequencies. However, due to the long wavelengths of low frequencies, and the laws of physics, horns for low frequency use need to be very large to work properly. For portability, such horns are often made smaller than optimum and designed to be stacked in multiples to act as a large horn - a common configuration for large outdoor events where this type of box rules, but impractical for small venues. As can be seen from the above, all solutions involve some sort of compromise, but by picking the correct combination of compromises high quality reproduction of bass frequencies can be achieved. However, most manufacturers produce the bass reflex type of box, even though it produces high levels of harmonic distortion, as they are simple to design, cheap to manufacture and therefore have higher profit margin and sell for less, and most consumers accept their sound and don't demand anything more. And now to what I consider to be the biggest problem with the majority of sound systems today - mud. Many people will say that loud bass muddies up the overall sound - low frequencies themselves don't do this, distortion generating, poor quality subwoofer speakers cause it. It should be entirely possible to have a sound system operating with the low frequencies pounding your body and still have the mid and high frequencies clear and well defined at a volume level that allows the listeners to easily talk to each other, but in practice this rarely happens. While the common "pseudo bass" harmonics can fool the ear into thinking the system has depth and "punch", these harmonics extend up into the midrange frequencies clouding the low ranges of other instruments and vocals in the overall sound mix. An attempt is often made to remedy the increased low midrange level by bringing these areas down on the system equalisers (giving the classic "smiley curve" often seen), however this just reduces the level of the sounds that should be present and does nothing to reduce the "muddiness" (remember that the harmonics are generated by the speakers themselves, and therefore not affected by equalisers placed earlier in the chain). To try and regain some of the lost clarity, the higher frequencies of the system are then often boosted, which increases the overall sound level. To get the desired effect of powerful low end, this approach usually ends up with the whole system sounding harsh and way too loud, often producing "ringing" in the ears afterwards (and the real possibility of permanent hearing damage). Consider the measurements of a typical, common mid-range powered 18" sub by a well known manufacturer (name obscured to protect the guilty) which retails for around $3500, shown to the right. The top graph is the frequency response, and clearly shows the performance dropping off below 63Hz, with a massive drop off below 50Hz. The lower graph shows what happens when this box is fed a 40Hz sine wave, with the level adjusted so a dB meter at 1m in front of it reads 80dBA (which is not very loud). The first peak is the 40Hz tone, and this should be the only peak produced by an ideal box. The subsequent peaks at 80Hz, 120Hz, 160Hz, and 200Hz are the generated distortion harmonics which clearly extend well into the midrange frequency area. Even at this low overall volume level, the harmonics are quite high compared to the fundamental tone, and only get worse as the volume is increased. Most of these issues can be solved by paying much more attention to the reproduction of low frequencies within the sound system, sadly an area which is often thought of as "a bit of extra thump". There are subwoofer boxes made that provide very good, clean, low distortion bass, but they are priced well outside the means of most working musicians, and aimed more at the larger production companies. However, many of these companies still do not utilise these products, instead preferring the "pseudo bass" reflex type cabinets. "Why?" you ask - because that is what most people are used to hearing. Not many have experienced clean, undistorted low bass (not even many sound engineers), and it DOES sound different - but once you have heard it a few times, the benefits are clear, literally. The more people come in contact with this, the more demand there will be on manufacturers to supply it, and the better off we all will be.